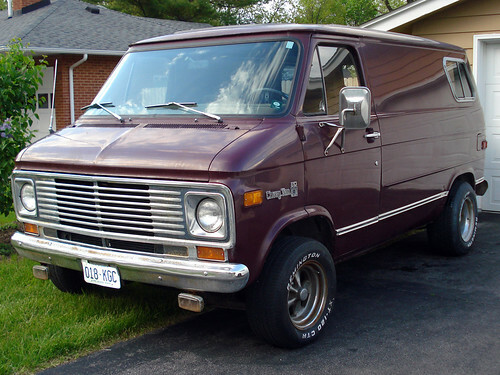 I know a lot of people think that 70s custom vans are lame or creepy but I have wanted one since I was a kid. TV shows like the A-Team are probably to blame. I found this riteous specimen on craigslist Sunday night and bought it Monday afternoon. It is a 1977 Chevy Van originally from Nevada. The body is solid and it is in pretty good running condition. It needs a lot of work but I only paid $1000. It has a good running Chevy 350 engine and trans and a lot of new parts; Edelbrock carb and intake, headers, flowmaster exhaust and quite a few other things. I might be in over my head on this project but that hasn’t stopped me before. Hey Brain the heck with what anyone said.I had in the past two 75 Chevy vans.The first was custom almost burnt orange high gloss with desert murals on the sides.350 hot engine.Was paneled,two captain seats and alcove in back with twin bed.Over head lighting through out. Loved it but all good things must pass.Later backed it with a passager job.Was only so so.Yours is two years up and still has a good look.I say go for it,but when you can.By this I am saying don’t break your self in money.Do what you have money for and are ready to do.Color I think is fine maybe if you want only add something to the sides.Look at it as and artist from where its at its open to what ever you have money for.Just don’t go overboard.I wish you all the luck,just would like to have a van again myself.All in good time.Remember keep her cool keep her trim and keep some rubber on the rims.